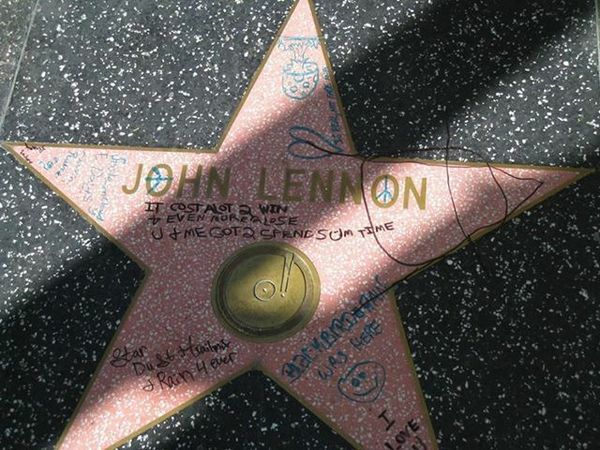 John Lennon's Hollywood Walk of Fame star defaced . Beatles Radio: The Beatles, Solos, Covers, Birthdays, News The Fab 4 and More! John Lennon’s star on the Hollywood Walk of Fame was defaced with graffiti and other markings over the weekend, just days before what would have been his 73rd birthday on Wednesday. Vandals scrawled messages, drew a smiley face and added other scribbling over the star on Vine Street near the Capitol Records Tower in Hollywood. The Beatles’ group star and the individual stars for the other members of the group were not damaged. Peace activist Jerry Rubin, who spearheads an annual celebration at Lennon’s star on the musician's birthday, said Monday that “the special annual public birthday celebration for John Lennon will take place as enthusiastically as ever” this year.